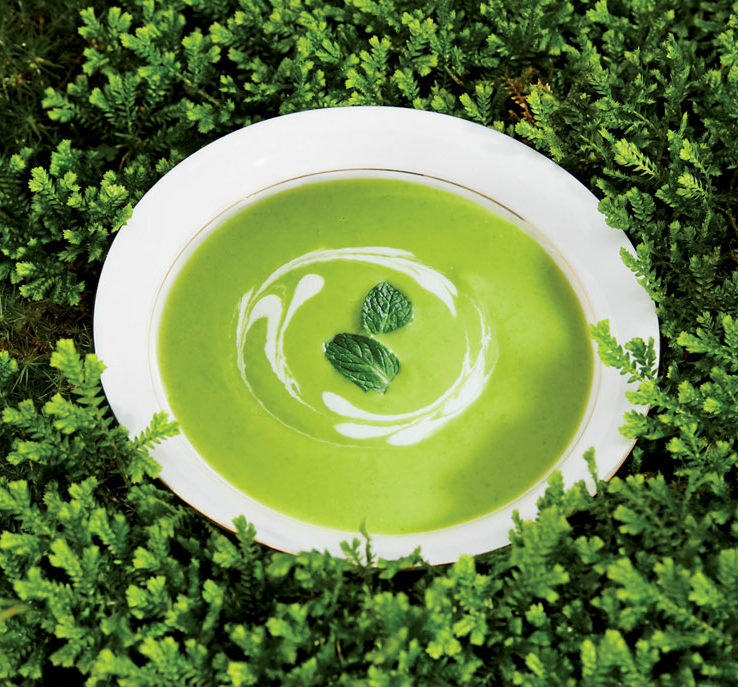 This gluten-free chilled pea soup recipe by Niki Ford is as much a delight as it is a cooking lesson. Though it’s simple, clean, and bright, critical steps are taken to elevate and intensify the earthy sweetness of the English pea: a pea pod stock is made to add a deep layer of pea flavor, quick cooking and cooling preserve the brilliant flavor and color of the peas, and thorough blending and straining provide a compelling, silky texture. A finishing dollop of yogurt lends tart contrast, lift, and a bit of much-needed fat to a fabulously elegant dish perfect for brunch, a light lunch, or a first course. FYI, you can make the pea stock up to 2 days in advance. Shell the peas, reserving the peas and pods separately. In a large pot over high heat, bring the pods, parsley, onion, and 10 cups cold water to a boil. Reduce to a simmer and cook for 30 minutes, stirring occasionally. Strain the pea stock through a fine-mesh sieve, discarding the solids. Set aside. Heat the oil in a large sauté pan over medium-high heat, add the leeks and let them sizzle for a minute, then lower the heat to medium-low. Cook until soft and tender, approximately 6 to 8 minutes, stirring occasionally and adding a few tablespoons of water if needed to avoid browning (which will affect the flavor and color). Add the peas and 2 cups of pea stock to the sauté pan. Turn the heat to high, bring the mixture to a boil, then lower heat and simmer until the peas are just tender, approximately 5 minutes. Purée the peas and their cooking liquid in a blender until smooth, transfer to a large bowl, add 2 additional cups of the remaining pea stock, and stir to combine. If needed, add more stock until the texture of the soup is creamy and not too thick. For the silkiest texture, pass the soup through a mesh sieve. (If your blender is powerful, skip this step.) Set the bowl of soup in a larger bowl of ice water to cool, stirring occasionally, to preserve the bright green color. Chill the soup in the refrigerator for at least 1 hour. Season to taste with salt. To serve, ladle the soup into bowls and garnish with a generous spoonful of yogurt and a sprinkle of mint.